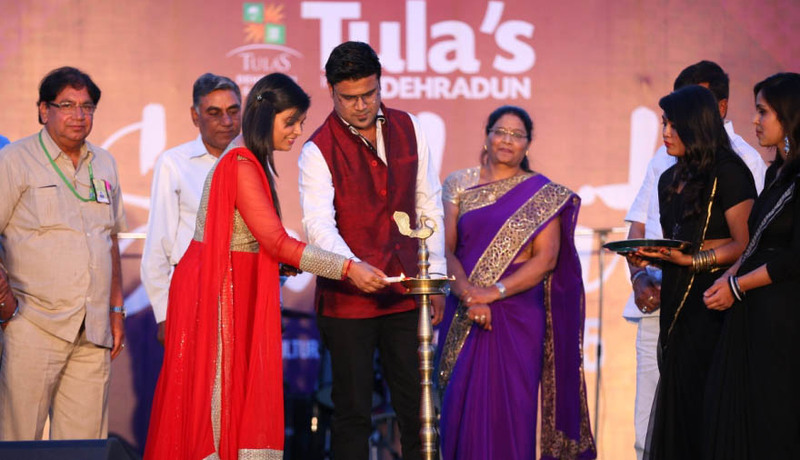 Dehradun : Tula’s Institute Engineering & Management College , Dehradun hosted its annual cultural fest – Sanskriti 2015 at its campus on 6th– 7thMay. The fest was marked by a performance by the famous Suryaveer along with his band Ehsaas on the 7thMay. Suryaveer will be making his debut in Bolywood’s upcoming movie Prague. Ehsaas is a Delhi based band which was formed in the year 2010. They have performed Delhi International Arts festival as well as with Kolkata Knight Riders IPL team. The event was inaugurated by the Chief Guest Professor PK Garg who in his inaugural address said that culture is an integral part of any educational institute. He stated that these fests teach us about our culture and we learn about skills like time and group management along with leadership skills. The inaugural ceremony was held by lighting the ceremonious inaugural lamp by the dignitaries including Chairman Tula’s Institute Sunil Kumar Jain, Executive Director Silky Jain, Vice President Raunak Jain and Professor PK Garg. Interacting with the students, the Chairman SK Jain talked about the relevance of Sanskriti. He threw light on the last year’s achievements of the institute. The two day festival was marked by several cultural and entertainment programs ranging from dance, ramp walk, and band war, standup comedy along with loads of singing. The cultural events like stepup, ramp walk, stand up, machan, sargam and rocktave were enjoyed by the students as well as the faculty.The ramp show by the college students was choreographed on the Cowboy theme. The cultural fest ‘Sanskriti’ is held each year to showcase the culture and talent of the college.